Hello %first_name%, We are way overstocked and we need to free up some space to bring in some new products for the summer. This is a great opportunity for you to grab huge savings on some of our most popular moto items. We have laid out some of the best deals by product category below. View all the sale items in the Spring Cleanup Sale. Get great deals from FMF, Pro Circuit and Akrapovic! We are WAY overstocked on two-stroke FMF pipes! They all have to go! We stock a variety of fuel tanks from Acerbis, IMS, Clockwork and KTM Powerparts. 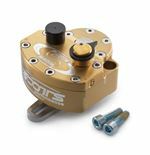 Steering damper kits from GPR, Ohlins, Scotts and Fastway are overstocked and on sale! A wide range of items from ECU modules to headlights now feature closeout pricing! A wide variety of piston kits including Vertex, Wiseco and Pro-X feature reduced pricing! Our best helmets are now on sale at unbelievable prices! Neck braces, knee braces, chest protectors, ALL ON SALE!